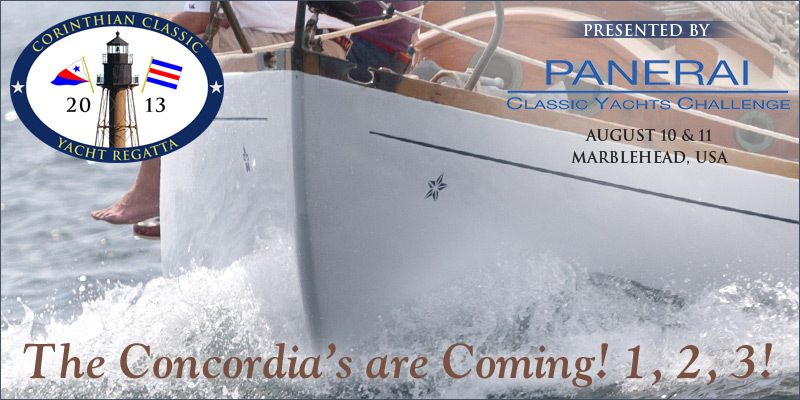 Just to let you know... we have three Concordia Yawls - Dan Smith's "Eagle" and John Eide's "Golondrina", and Bruce Fenniken's "Principia" - already entered into the 2013 Corinthian Classic Yacht Regatta - presented by Officine Panerai (www.panerai.com). We know there are a few more of you out there that would love to make a run at some silver, so why not join them now. In celebration of the 75th Anniversary of the Concordia Yawl, the Corinthian Classic Yacht Regatta is honoring the Concordia Yawl and all Hunt Designs at this year's event. Our featured speaker and honoree will be James H. "Sham" Hunt, son of Raymond C. Hunt. This is an excellent midway stop if you are cruising back from the events in Maine to the New Bedford Yacht Club for the 75th Anniversary Reunion. Our port will be in the middle of the Marblehead Maritime Festival. This a rare opportunity for Concordia owners to gather and sail your boats in a Corinthian spirit while participating in toasting the Hunt name and lineage. We urge you now to enter this event or just plan to make dinner reservations for what will certainly be a fascinating and entertaining evening with "Sham". Last years' event honoring Halsey Herreshoff was sold out.